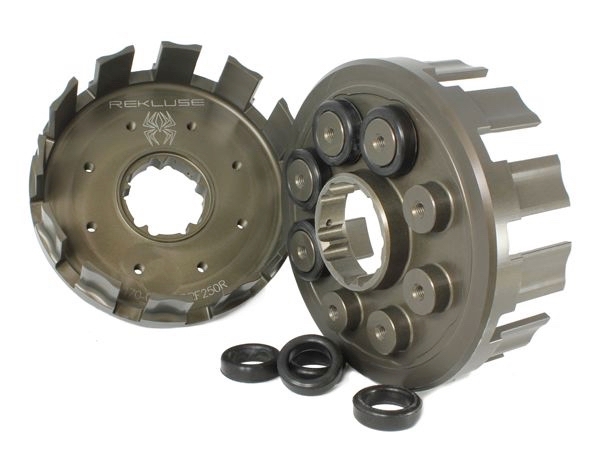 Rekluse clutch baskets offer the absolute best in durability and performance. Rekluse exclusive cushions offer the greatest longevity, protecting your clutch and transmission under the most extreme circumstances. Coupled with unique Rekluse hourglass shaped tangs and machined with precision tolerances to protect against notching, our baskets stand alone above anything currently on the market. Tested and developed in cooperation with Factory FMF/KTM offroad race teams. Do I Need a New Clutch Basket? The following outlines Clutch Basket Cushion Failure. Some Clutch baskets will last a season, and some last only hours. If the dampeners go unchecked clutch damage will result. 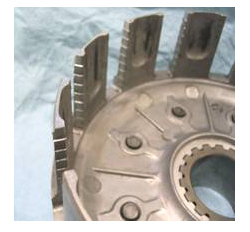 Most OEM Clutches use elastomer cushions to protect the clutch from shock loading applied to the basket by the drive train and/or engine during normal operating conditions. The cushions are located between the clutch basket body and the ring gear. The cushions take up the slack between the ring gear and clutch basket so that under normal loading they rotate as one. Under extreme loading the cushions provide a cushion so the ring gear and basket can float independently and keep shock loads from being transferred to the clutch. As the cushions wear, the system gains slack and shock loads start getting transferred to the clutch. This creates a hammering effect between the clutch basket and ring gear. The hammering transfers to the clutch plates and causes the plates to wear away at the clutch basket and center clutch hub. If the cushions continue to go unchecked, the hammering progresses until the clutch fails. Prior to installing your clutch, it is recommended that you check the condition of your Clutch Basket and Center Clutch Hub. An indication of failing clutch basket cushions is grooving or notching of the Clutch Basket Ears—where the tabs of the friction discs index into the clutch basket. See the following picture. Another indication of failing cushions is notching of the center clutch hub where the steel drive plates index to it. Unfortunately the OEM clutch basket does not provide a means to maintain the cushions. After the cushions wear out, the clutch basket must be replaced. The choice is either an OEM clutch basket, or an aftermarket basket. The advantage of an aftermarket basket is that the cushions are serviceable. Click the button below to add the REKLUSE CLUTCH BASKET HONDA to your wish list.